Where did the Fundamental Principles come from? The principles were first articulated by the Swiss jurist and co-founder of the international Red Cross, Gustave Moynier. His four principles of the 1870s ‒ ‘centralisation’, ‘foresight’, ‘mutuality’ and ‘solidarity’ ‒ were more firmly focused around the role of the national societies and their relation to the ICRC and each other. Right from the get-go, the idea of giving aid based purely on the needs of the suffering, irrespective of religious, ethnic or political affiliation, was built into the Geneva Conventions. Article 6 of the 1864 Convention stated that wounded or sick combatants would be collected and cared for regardless of nationality. As late as the 1920s, Edmond Boissier, an ICRC Vice President, could still speak of ’universal charity’ as a defining characteristic of the Red Cross. Reference to this quality invoked an earlier age when philanthropy, charity and humanity were synonymous and intertwined with the life of the churches. 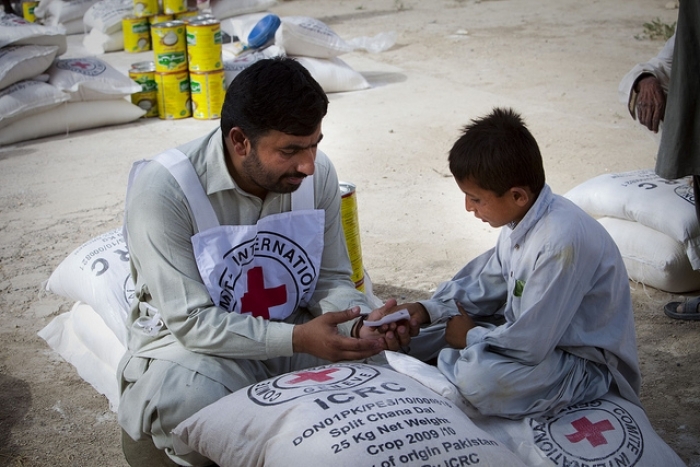 The privileged role of the ICRC in safeguarding, maintaining and disseminating the principles was highlighted in 1915 when the ICRC drew up its Statutes, in 1921 at the 10th International Conference in Geneva, and again in 1928 when new Statutes were adopted at the 13th Conference in The Hague. None of these statements specified what would happen if a national society departed from the principles. This omission was made all too apparent during the wars of decolonisation when relations between the national societies of Europe’s colonial powers and the ICRC were often fraught. The thirteen ’Oxford Principles’, were framed after the Second World War and reaffirmed at the 18th International Conference in Toronto in 1952. ’Neutrality’ did not explicitly feature but promoting peace and the fight against epidemics were explicit objectives. There was also considerable emphasis on national societies being representative and democratically organised, which proved particularly problematic for the newly independent societies in Africa and Asia as they negotiated the end of empire. A decade later Jean Pictet published his seminal study, Red Cross Principles (1956). Pictet’s seven Fundamental Principles included humanity, impartiality, neutrality, independence and universality, but interestingly not today’s ’voluntary service’ or ’unity’ ‒ instead referring to ’equality’ and ’due proportion’. He also paired the Fundamental Principles with a wider set of ’Organic Principles’ which, in a gesture to Moynier, included both ’solidarity’ and ’foresight’. How do the principles work in practice? The principles have framed key debates about humanitarian aid for many of history’s most major and memorable conflicts. Looking back at the wars of decolonisation, such as Algeria and Kenya, did racial prejudice fuel the selective application of standards of humanity? In Biafra: in the face of mass starvation and great suffering, is neutrality tantamount to passivity; can it be morally justified? In Bosnia and Srebrenica, faced with forced displacement and the creation of UN safe-havens offering little real protection, did ostensibly independent aid agencies become passive participants in acts of ethnic cleansing? And finally, coming to the present day, has the integration of aid into military and security strategies – in Iraq and Afghanistan – made any claim to independent humanitarian action a myth? As today’s ICRC President, Peter Maurer, recently argued, history is much more than a record of what happened in the past. It is a rich repository of experience for the humanitarian sector to draw on in the here-and-now, as they tackle crises in Syria, CAR and South Sudan. History also serves as a vantage point from which humanitarians can reflect on current challenges facing the principles – whether in Syria, South Sudan or the Central African Republic − and anticipate those that may emerge in the future. While individual principles have assumed a sharper and more settled definition, this is less true of the principles’ relation to each other. Some distinguish between the principle of humanity – as the ultimate humanitarian objective – and impartiality, neutrality and independence, as means to reach that objective. Others present humanity and impartiality as “substantive principles” and neutrality and independence as “field tested tools”. This is not mere semantics. The internal logic of the principles and how they’re prioritised is profoundly relevant to decision-making in the field. There is an unresolved – and perhaps unresolvable − tension between the universalism of the principles and the need to work within national frameworks of governments, donors and supporters. Although a challenge for the humanitarian sector in general, it is a particularly salient issue for the international Red Cross and Red Crescent Movement. Although a lasting arrangement may never be reached, in order to protect the principles, the absolute independence of the ICRC must be creatively and proactively balanced against the relative independence of the national societies, which act as “auxiliaries” of their respective governments. If history demonstrates nothing else it is the necessity of developing a fuller and more nuanced understanding of the political frameworks and processes into which humanitarians insert themselves. This is vital to how the ICRC and national societies relate to the communities in which they work and how the principles are operationalised. Without such understanding, humanitarian principles are much more easily side-lined or subverted, notwithstanding the best intentions of those who cherish and champion them. The Principles are an expression of the unity of the Movement, yet there is a necessary pragmatism to their implementation. The biggest challenge of all therefore may not be to preserve the Principles in a state of perfect purity, but to know when to compromise, how far to compromise, and what the effects of such compromises are. There is no denying that Fundamental Principles lend political legitimacy and moral authority to humanitarian action. But if the Principles are to be passed on to future generations, humanitarians must walk the tightrope between necessary compromise and co-operation with state and non-state armed groups – and becoming complicit with their agendas. Andrew Thompson is Professor of Modern History at the University of Exeter. He is currently organising a conference with the International Committee of the Red Cross, “Connecting with the Past – the Fundamental Principles in Critical Historical Perspective”, to be held at the ICRC Humanitarium in Geneva on 16-17 September 2015. This entry was posted in Actualités / News, Articles and tagged Humanitarian Aid, ICRC by Fabian Klose. Bookmark the permalink.